The Venice Art Crawl focused on Washington Boulevard for its Summer edition, which was a nice change of pace - and scenery - if a little sparse this time out. 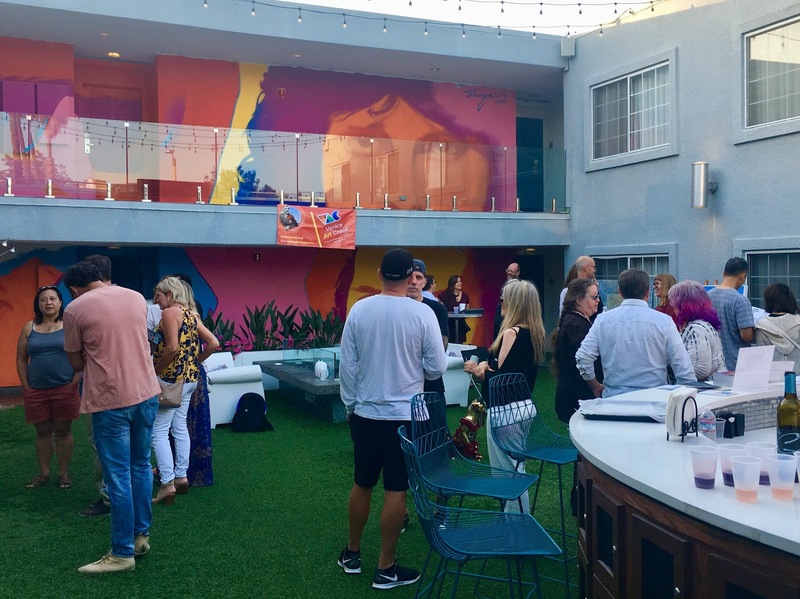 There was a headquarters set up at The Kinney hotel, and the art stops went from there to the beach, with a few too far away for foot outposts going on all the way to Rose. The Kinney art party was upstairs next to their tiny pool that I had never seen or known about. 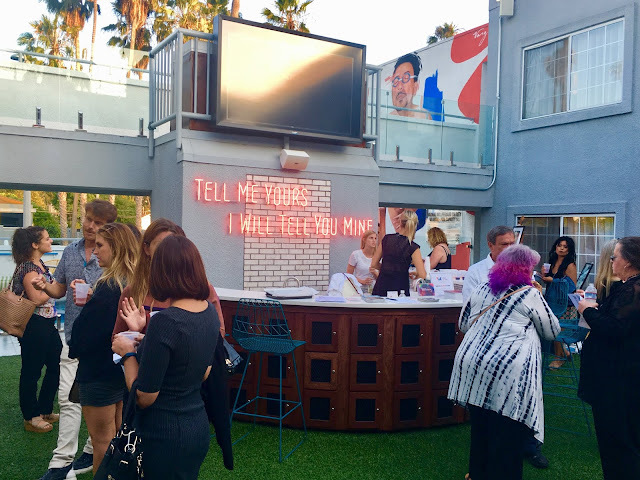 Artists and friends mingled around a bar, and enjoyed the golden hour lighting. Of the group show happening there, my favorite was Annie Seaton's work. 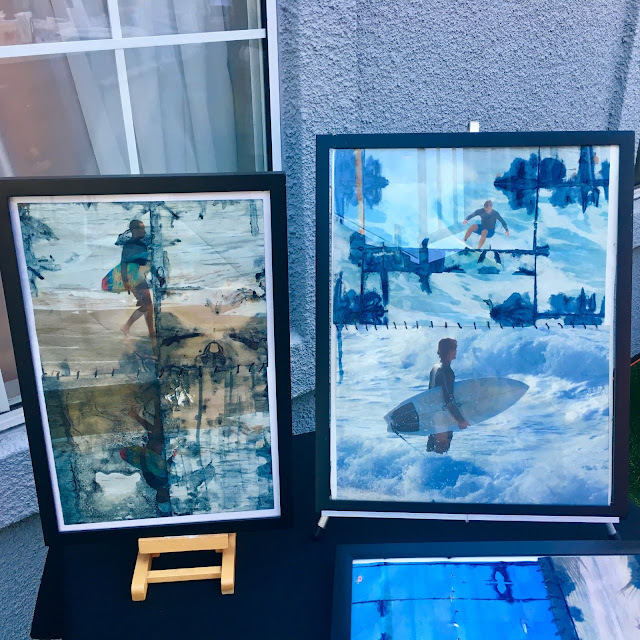 She takes her surf and ocean photography and prints them out on rice paper somehow, paints them with natural indigo dye, and sews the different pieces together, using a whole bunch of talents at once. I loved them. Phantastic Photography by Lily was also cool, featuring her water reflection photos. There's no time to linger when you've got more art to see, so I left the scenesters at The Kinney to it, and took off toward the beach. There was a big stretch of wasteland with no art stops on it, which was too bad, as there are a lot of potential venues there on Washington ... maybe next time. The real action was all centered around Washington Square, the end part by the pier. It was a gorgeous night, so there were a bunch of tourist people out anyway, but the Art Crawl made sure that the locals were out galilvanting around too. 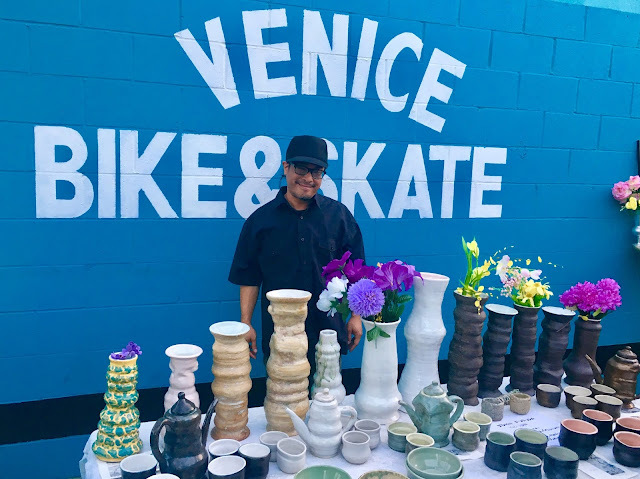 I hit up Venice Surf & Skate, and admired the ceramic work of John Fukuda from the Temple Of Mediclaytion. I keep meaning to take a class there, and chatting with Fukuda reinforced this intent, as he told me it changed his life. I can dig that. I kept running into Venice pals, which is really always the best part of the Venice Art Crawl. The sunset was so beautiful right about at this point that it was probably my favorite work of art of the night. 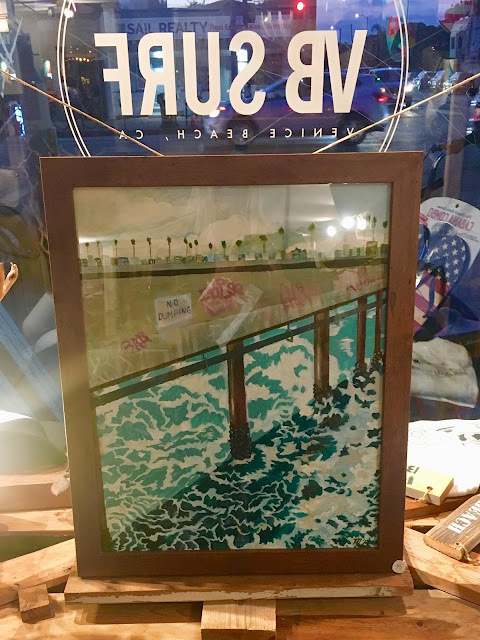 The entire Venice Pier was lined with admirers trying to capture the beauty that is always better in person. But we all tried anyway. 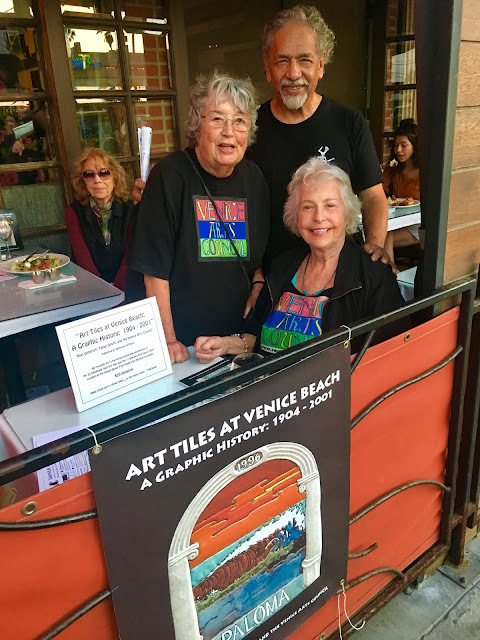 Mercede's Grille was full of sunset hour revelers, and the wonderful real deal Venice ladies like Emily Winters were there selling their keepsake of a book Art Tiles At Venice Beach: Graphic History of Venice 1901-2001. The book itself is a fundraiser to preserve the fantastic old tiles on the beach benches. I was extra touched that they gifted me one of the books, and will add it to my library of Venice lore (which I'll hopefully be a part of soon - stay tuned!). Another highlight of this Crawl was happening in the alley behind L.A. Gastronomy (next door to Mercede's). Live painting was gathering a crowd back there, and street artist Honor was in the midst of creating a mural of Robert DeNiro from Taxi Driver. 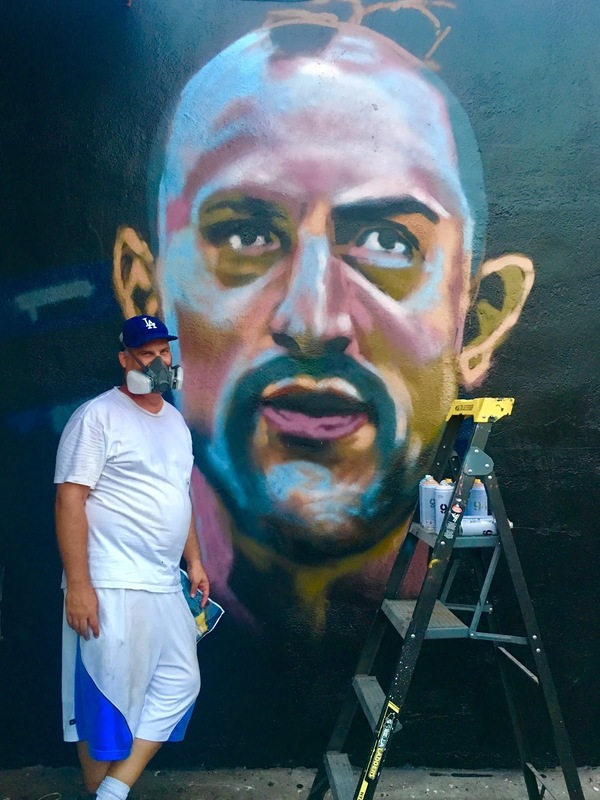 He kept his fumes mask on for the photo in the time-honored tradition of graffiti artists being anonymous, but I say be known for your awesome work. It was an honor to meet you, Honor. Around the corner wall, another mural was being done by Showz Art, who was halfway through a rad rendering of Trayvon Martin. Some of the best art in Venice is in alleys, and it's always worth getting off the beaten paths to discover something great. Duck behind this strip of Washington next time you're there ... it's looking good. The Cow's End was already closed at like 8:00, which was funny because the map said 10:00, but oh, well. A dude was set up out front anyway, and a lot of people were talking to him about his work, so that was good. 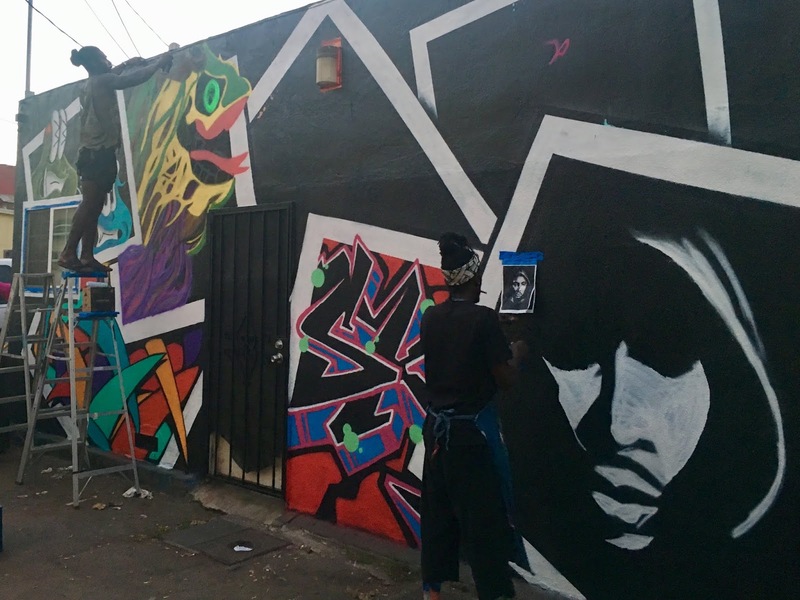 Fresh air, fresh art. The VB Surf Shop was featuring work from Maggie Boelter, a Venice local, whose bio says she grew up swimming at Tower 26. 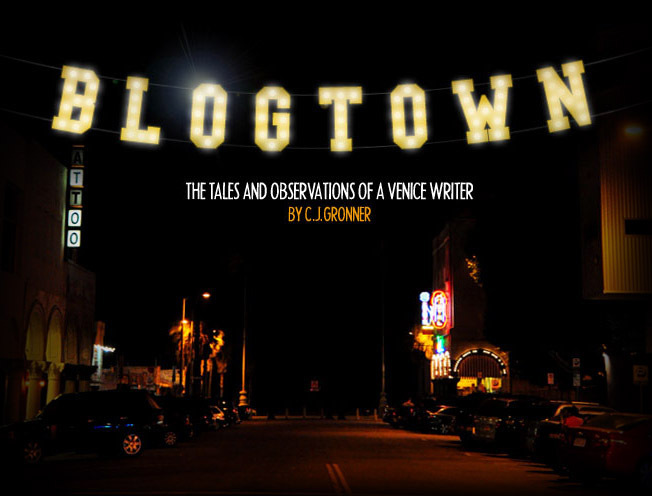 Awesome - as was her work of Venice beachy themes. Priscilla Ortiz and Natalie Strong were showing their stuff at Arbor, where the skateboards were as fun to look at as the art. Wine and snacks were being shared pretty much everywhere, and Arbor was no different. What a great looking shop, check it out if you haven't been in for a while. Aren't they due for a music show there soon too? I believe so. 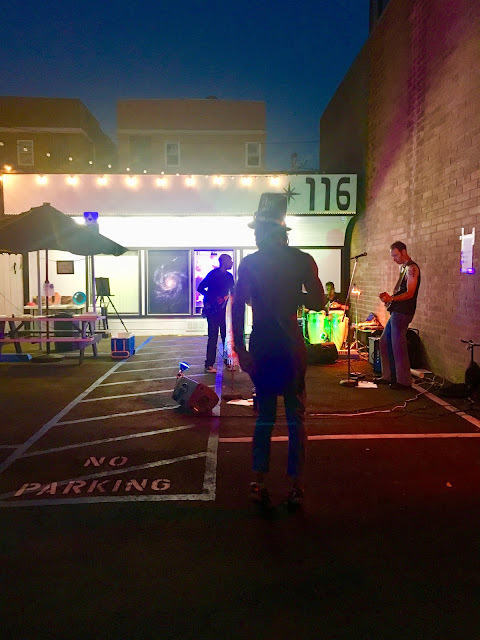 Next door at Aesthetic Ambition Piercing & Tattoo was the most rocking stop on the Crawl, as a reggae/ska band, Funky AF, was blasting out through the whole neighborhood. 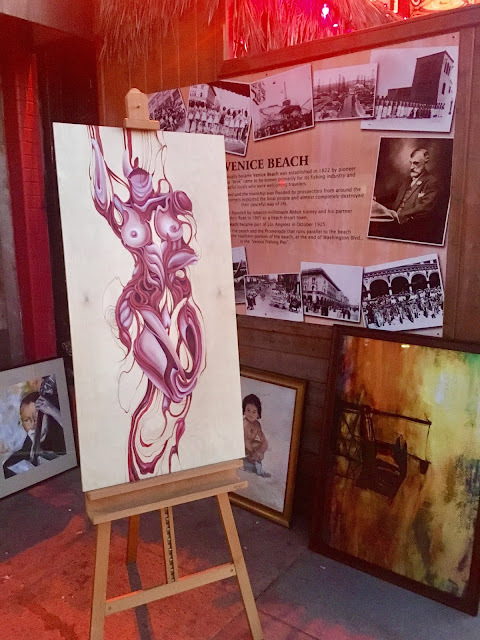 There was more art set up outside, but the main deal was folks getting DOWN to the band, especially one shirtless dude in a top hat that was extra feeling it. That's the Venice Vibe, and that's what is great about our town celebrating art - not just for events like the V.A.C., but all the dang time. Everyone was loving it, and it felt like full throttle Summer. From there I headed over to the new New Deli (which I didn't even know was finally open, and will forever be Sal's to me), but they were shut up tight, well before their map's stated closing time. Lame. Especially as at this point I was feeling that I hadn't eaten yet, and probably would have picked up some stuff from this new New Deli, but nope. Oh, well. There wasn't a whole lot of time left in the Crawl, so I zipped over to Turning Point Pilates to check out the work of Marian Crostic. I'd long heard of Crostic's work, as my brother hangs it all for her when she has exhibitions, and she's lived right on Abbot Kinney forever. 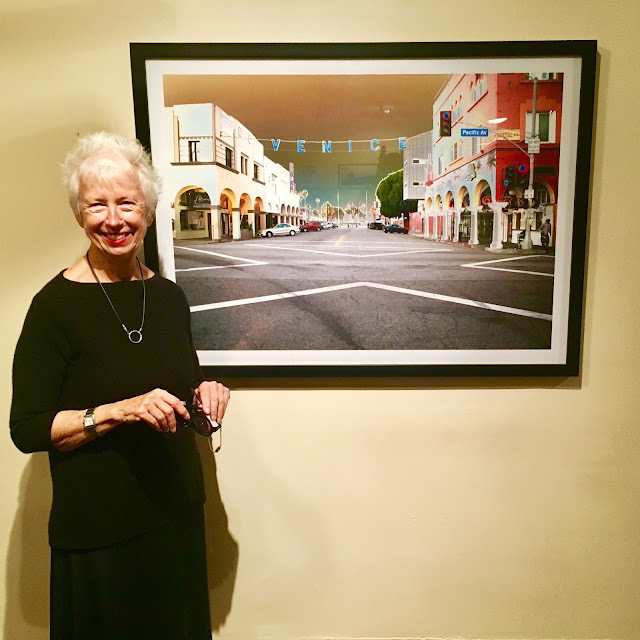 Her Pre-Dawn Venice pieces were lovely, as was Crostic ... as was the wine and cheese. That was that for the Crawl for me this time, as I have a whole lot going on and was just grateful to see some art, some friends, and some gorgeous sights. 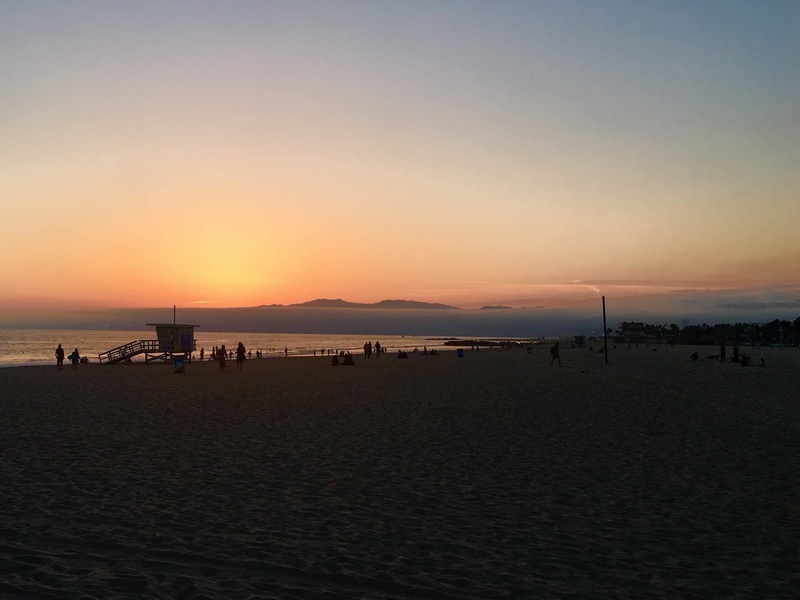 The next Crawl will be the After-Burn one (September 21-23 in Windward Plaza) and that's always one you don't want to miss, as Burning Man comes to Venice - where it really should still be like Burning Man all the time. 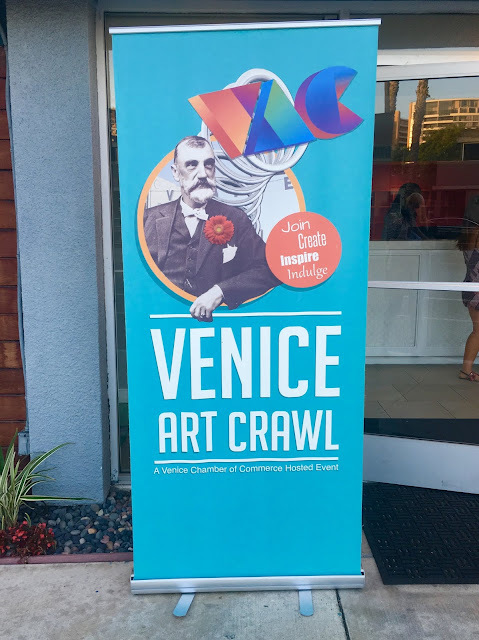 The Venice Art Crawl does a lot to help with those vibes, and I really try to never miss it to get that fix. See you in September, Hippies! XO.